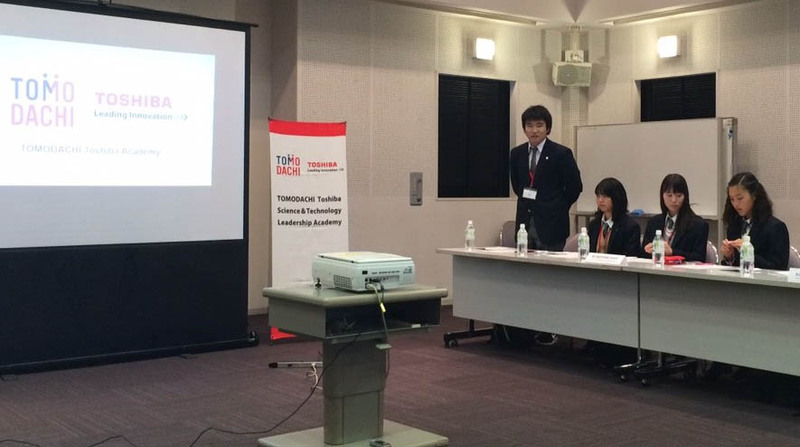 On October 24, 2015, the 2015 TOMODACHI Toshiba Science & Technology Leadership Academy gathered its program participants from this summer at the Yoyogi Olympic Center for its post-program presentation session. 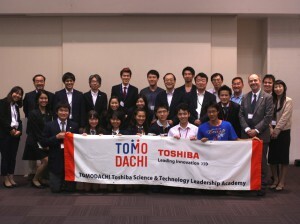 The TOMODACHI Toshiba Science & Technology Leadership Academy (TTA) is an international exchange and leadership program intended for high school students and teachers from both Japan and the United States. The program encourages cross-cultural interest in the fields of STEM: Science Technology Engineering and Math, and promotes mutual understanding and friendship. The objective of this program is for participants from both countries to work together to identify and develop recommendations for disaster-resilient smart communities around the world. The post-program presentation began with opening remarks from Mr. Keisuke Omori, the CSR General Manager from Toshiba Corporation. Seven students, three teachers and five alumni who took part in the program as teaching assistants, gave short reports on their experiences and achievements following their participation. Another participant, Kiyokazu Tanaka from Waseda University Senior High School, reflected on his own experience and shared his aspirations with the group. TOMODACHI alumni – called the “TOMODACHI Generation” – will continue to develop and deepen their connections to continue their renewed interest in the fields of STEM in order to better the bonds between our two countries and create a better future for all.